Do you have a job description? Is it working for or against you? Most agents tell me they did not receive a job description when they started in the business (or in the interview). If not, why not? In my last blog, I discussed the fallacy that agents should start out as ‘independent’ business people. Now, I don’t mean they shouldn’t take responsibility for their actions and success. I mean that we shouldn’t abdicate our responsibility to teach, train, and coach them so they become great salespeople (so they can become independnet). Besides not having skills they need to succeed, they usually don’t even know what the job is! As I teach management courses nationally, and speak nationally, I see many examples of poorly thought-out job descriptions and activity plans. What do you think is a poor job description? Take a look here. ( a preview is to the right). My conclusion: This job description was written by an academic who had never been successful in real estate! Part of that abdication of management responsibility, I believe, is managers not providing a prioritized job description to agents. Notice I said ‘prioritized’. 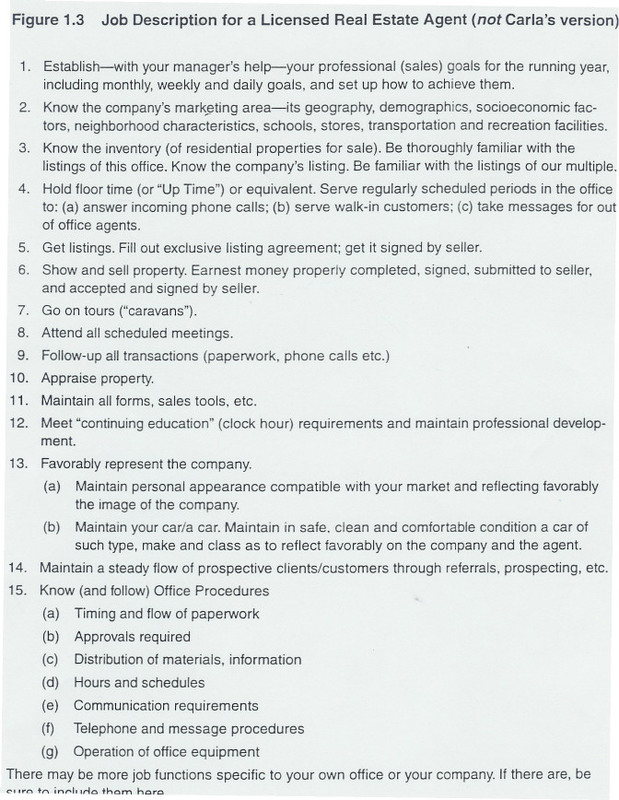 Which activities should the agent start with? Which are important to be successful? Which are less important? Before I share my job description with you, please write the job description you believe is the one you follow. Is it helping your hurting you prioritize your most important activities? 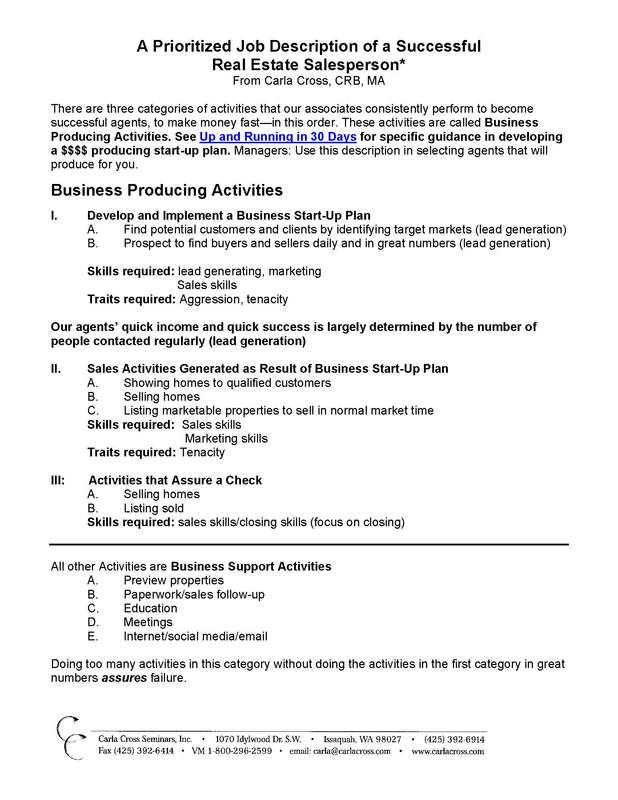 Now, take a look at the prioritized job description I developed as a foundation for the new agent’s start-up plan, Up and Running in 30 Days. How does yours differ? What does your job description say about what you think is important? Are you gaining as much success as you should? 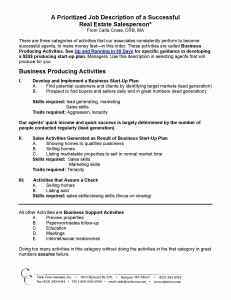 What does your job description and business plan have to do with those results? Get that job description refined. Talk to other agents to assure it’s the job description that reflects how you want to work. Compare that job description to what you actually do every day. How close can you come to your job description in your everyday execution? Now, you’re getting much more effective and efficient. 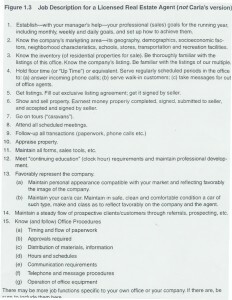 Getting the guidance you need to succeed: If you’re a new agent (under 1 year), you need Up and Running in 30 Days. If you’re a seasoned agent, you need The On Track to Success in 30 Days System. Why not assure you have a better year in 2012?